For the past year or so, I have been working behind the scenes with SDL. While I used Eclipse over the course of the development period, I started leaning more to CLion. Starting in August 2015, I started migrating my projects from Eclipse to CLion. That process wasn’t smooth. As you may or may not know, Eclipse allows you to define the location of library files through a GUI. CLion uses CMake to manage all the linking business. This can be confusing if you have never dealt with CMake before. And so — after a month later, here is how I got SDL and CMake to work together. The source code is also available on github. The link for that is down below. Here is what I used, and what you probably will need. CLion v 1.0.5 – but the latest version should work. Go ahead and create a new CLion project. 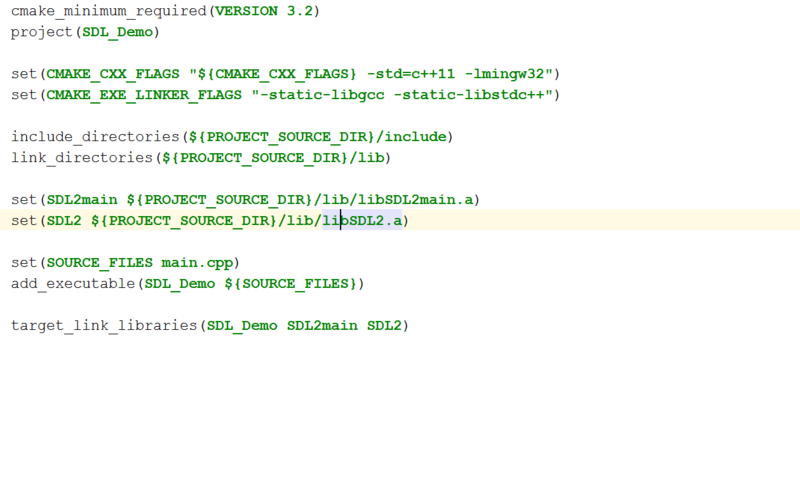 In your project directory, create a new folder titled “lib”. Put the library files (.a) here. Also in your project directory, create a new folder titled “include”. Put your SDL header files here. You do not have to explicitly name and organize the files as described above. What ever floats your boat. Here we will edit the CMakeList.txt file. If you are unfamiliar with CMake this can look daunting, so I will try to explain what is going on here. This line is necessary when compiling as C++. Specifying where our SDL header files are located in relation to the project. Specifying where our SDL lib files are located in relation to the project. This does the actual linking between our project and SDL2 libs. Going back into your main.cpp file, go ahead and write the following code. Go to that directory and drop the SDL.dll in there. When you try and run it again… it should run.